MANCHESTER, England, April 12, 2016 (ENS) – Critically endangered species of fish are being sold in UK sushi restaurants without accurate labeling, finds new research by scientists at three British universities. An investigation by scientists at the University of Salford, University of Bristol and University of Exeter, to identify levels of mislabeling or non-labeling on restaurant menus, found evidence of lax labeling practices in the UK’s service sector. “The sale of rare fish species under generic terms such as ‘tuna’ or ‘eel’ hinders consumer choice with potentially damaging economic, health and environmental consequences,” warned Stefano Mariani, professor of conservation genetics at the University of Salford. “As consumers we are getting much better at demanding information in shops but we do not demand the same standards when eating out,” he said. 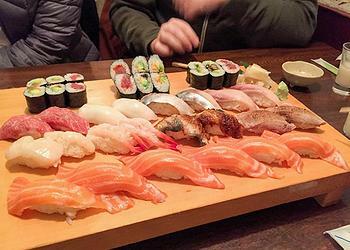 Scientists investigated levels of seafood labeling accuracy in 31 sushi bars and restaurants across England. A total of 115 fish samples were collected in restaurants in Manchester, London, Bristol, Liverpool, Exeter and Newcastle, between September 2014 and 2015. Two independent sets of samples were collected in restaurants in Manchester, Liverpool, and Newcastle, with a minimum of two weeks between sampling. In all cases the individuals involved in the collection of fish tissue posed as normal customers and sampled in an as unobtrusive way as possible. The scientists used DNA barcoding to screen samples of tuna, eel, and a variety of other products of less distinguishable white-fleshed fish. “These can comprise hundreds of fish species whose flesh is virtually unrecognisable by consumers and hence easily susceptible to substitution,” the researchers wrote in their study. Seafood fraud is any illegal activity that misrepresents the fish being purchased. Although some mislabeling may result from unintended human errors in identifying fish or their origin, the authors point out that often it is driven by economic gain, where cheaper or more readily available species are sold instead of expensive, desirable or supply-limited species. The DNA barcoding tests showed that 10.4 percent of seafood served was not correctly described on the menus of the sampled restaurants. “The overall level of mislabeling and substitution was moderate,” the scientists wrote in their study. In the case of tuna, three samples were sold as tuna, but identified as Yellowtail and Japanese Amberjack. In two other cases, the restaurant advertised a specific Thunnus species – one restaurant claimed to sell Yellowfin tuna, Thunnus albacares, while highest similarity scores by barcoding suggested potential substitution with Big-eye tuna, Thunnus obesus. Another restaurant claimed to serve Bluefin tuna, but barcoding revealed matches with Big-eye and Yellowfin tuna. Although the common name Bluefin tuna encompasses Atlantic Bluefin, Thunnus thynnus, Pacific Bluefin, Thunnus orientalis, and Southern Bluefin, Thunnus maccoyii, none of them matched the barcoding results. 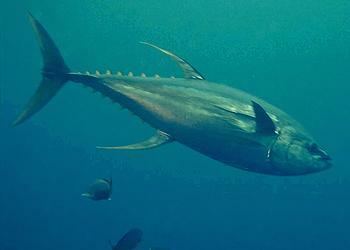 Regardless of the high conservation concern over Bluefin tuna species and listing of Bluefin species as Endangered or Critically Endangered on the IUCN Red List, and their inclusion as products to avoid due to sustainability issues in the Good Fish Guide, Bluefin tuna was found on the menus of two restaurants sampled by the scientists for this study. Bluefin tuna is highly valued for its quality and taste, making it a target for economic fraud, with substitution for a lower value tuna species, as was identified in one of the samples. The European Union is the largest single market for imported fish and fishery products, representing about 23 percent of world imports. Part of the legal framework is an EU regulation enacted in December 2014 that places an onus on anyone selling seafood to label it clearly and accurately, providing consumers with transparent information. The EU labeling legislation applies to all pre-packed and non-packed fishery and aquaculture products at all stages in the retail supply chain, but excludes restaurants, which only have to provide information on allergens. The authors point out that seafood fraud can have serious health consequences when mislabeled seafood masks undeclared allergens, contaminants or toxins. Restaurants are not obliged to mention on their menu what species is being sold but they are obliged to keep and give this information to the consumer if asked. Mislabeling can also provide cover and profit for illegal and unregulated fishing and seafood, which could have damaging implications for fisheries management and conservation.